Can we talk seriously for a moment? No? How about a hot second? Okay. I was given the opportunity to read and review Harold McGee's new book "Keys to Good Cooking ." Folks, there's so much useful information in this tome that I don't even know where to begin. There are chapters focusing on safety, kitchen tools, and basic cooking methods. There are pages and pages about meats, fruits and veggies, breads, and, my favorite, sweets. It's written in an easily-understandable fashion, with each chapter beginning with a simple introduction followed by bullet point after bullet point of practical factoids. I'm not exaggerating when I say that it's a reference I'll be keeping within reach from now on. Seriously. It's sitting on the desk beside me right now. Fluffy. Fluffy like my hair on a humid day...but much more attractive. In honor of the book, I made some cranberry pecan muffins. I know, what a way to celebrate, right? Handy tip #1: Cranberries stay fresh in the fridge longer than most fruits because of their high acidity. Handy tip #2: It's important to sort through the berries before using them in a baked good, as one sour gem can spoil the whole thing. Handy tip #3: To get a "shapely peak" (Harold's words--catchy phrase, yes? ), avoid overleavening, fill the cups nearly full, and bake at a high temperature (400-425F). Ah. I love science. And food. Ya done good, Harold. Preheat oven to 400F. Line or spray 12 muffin cups. In a large bowl, combine the dry ingredients. In another bowl, whisk together the wet ingredients and stir into the dry ingredients just until moistened (batter will be lumpy). Fold in cranberries and pecans. Bake 15-20 minutes. Que vista tan fantastica, esta receta se ve de lujo. Those close-up shots are killing me Grace! Looks so fluffy and moist. I don't know, maybe it's because I'm sitting here at 5:50am and I haven't had breakfast yet, but wow do those muffins look amazing!!!!!!!!!!!! Thank you so much for sharing the recipe. PS - how wonderful that you were asked to review the book. Very nice! Fluffy, moist and BERRY delicious! Cranberries and pecan sound delicious! Cranberries and pistachio is one of my fav combos too. My Marcia Brady hair never gets fluffy.. Thanks for the good tips on maing muffins. Lord knows I can always use the help when baking. Wow, thiose muffins are fabulöous and so tempting! I loved the line about your hair. too funny. This book sounds like a good one! The muffins don't look half bad either. Yum! I've heard such good things about that book! Definitely want to get it. Laughing at the hair comment! The book does sound good, though--I love it when they explain the science behind things! The book sounds great! I like how they link food and science, that's y I like Alton! I have seven bags of cranberries in my freezer. I need to use them up, since it's time to stock up on more! That's my favorite kind of book, Grace. Love the tip about high heat...will try it next time I make muffins. So excited we are getting into the cranberry season. Living in New England has its perks. Until January when the death of winter really sinks in. Thanks for the scientific baking tips! I can surely use them! i was so fascinated by him Mr. McGeeeeee! He was on NPR last week. Such knowledge. If I had known about him sooner I swear I would had grown up to be just like him. I am loving this book!!!! The muffins look tasty - I love the combination of cranberries and pecans. Hmmm, I hadn't heard of that book. I'll check it out...just got a $5 off coupon for Borders! These muffins look delicious! I have two bags of cranberries just hanging out in the freezer. I guess they now have a mission! Ahhh... cranberries, how I love thee. And I'm ALWAYS on the hunt for a nice, high dome. These will be perfect for our next weekend breakfast! Ahh, I see a hint of cinnamon here :) I'm looking forward to hearing about more baking science tips! This sounds like a really interesting book. "Fluffy. Fluffy like my hair on a humid day". Seriously, my favorite line in the post! I need to check this book out. As I was reading a cookbook at the library the other day, I thought about the need for a "Dummies Guide to Cooking". A book that would actually show you in steps what: the different types of peaks in whipped cream should look like; when you are told to whip until light and frothy (what does that look like since your frothy and my frothy may look different) and so on. Any hint or tip that can make me a better cook, I'm all for! Seriously wonderful muffins! I think they're perfect for a fall breakfast. That book sounds terrific. Must check out! PS - Come to my blog and enter to win another great book! One more book I need to get! Sounds packed with great information. 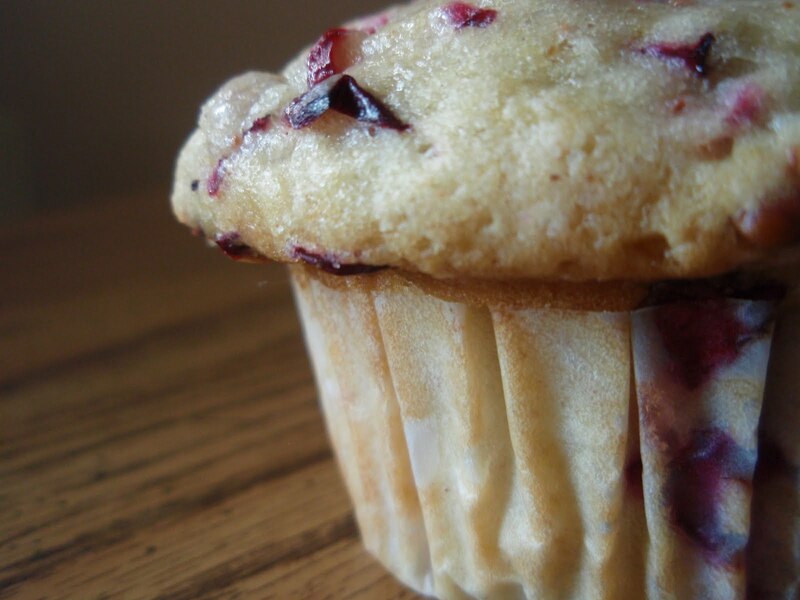 I also like that these muffins are packed with cranberries. They look delicious! How can I say no to scientific superiority? Looks tender and delicious as usual, Grace! Holy Muffin! (Corny. I know) Those muffins look delicious! Perfectly fluffy. Can you throw away one muffin over here? Never liked Science until I started cooking! They sure go hand in hand. Thank you! mmmm I love cranberries :) looks so moist! i love how moist this look...yummy! I'm so glad that you've found this book to be such an excellent resource! Thanks for being a part of the tour. Mmmm Harold did do good and so did you!!!! Good "peak" info. I always wondered why sometimes I get domes and sometimes I don't. Your muffin almost looks like a firework exploding. Maybe its just me- comes from cloud watching with my kids. This muffin is very appealing.! Mouth is watering. Oh my. I need to make these! Since I live alone I only bake if I am going to share with others. But when I go to the bakery this if THE muffin I always order. Yup it is that time to buy fresh cranberries again and they sure do last long. In March i found a bag way back in the frige from last nov. Wow! These muffins look good and fluffy! These look awesome. I love cranberry muffins! And I love Harold McGee! Must check out the book. Your photography is always as delicious as your recipes. 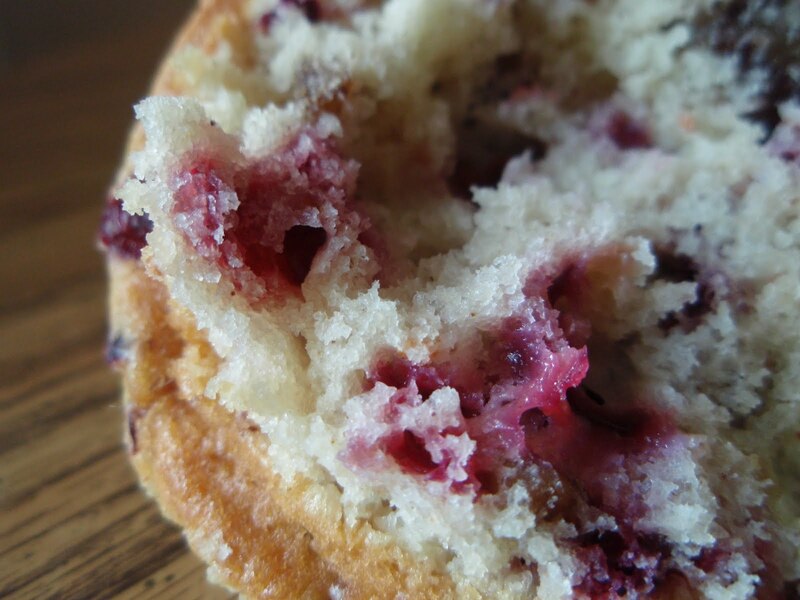 Cranberry muffins are a favorite of mine so I want to give your recipe a go. Thanks for sharing. Sounds like a textbook that I could used in my classroom. I love cranberries! Oh my! The photo just stopped me dead on the keyboard. It's beautiful photograph, and no doubt a utterly delicious muffin. P.S. I have been following you for the last couple of years-I don't know why, I was not officially following you. I am now!! Interesting idea, baking at a high temperature. I'm going to try that next time. This sounds like a great book!! I've never had a book I liked so much that I've carried it around everywhere with me =) These muffins look really yummy- they're so light and fluffy! I wasn't a huge cranberry fan until the last couple of years, but now I can't get enough of them! Those look delicious and tasty, I have been totally slacking! Grace, you are SO funny :-) And yes, these muffins sure look yummie, so fluffy and colorful...love the photo! Very irresistible! the first pic is killer....love your muffin combo...great tips, we love pecans and cranberries are always in our freezer..
the muffin looks so tempting I wish I could grab it and hav one for breakfast right about now! Your cranberry & pecan muffins look like the real deal, like winners!! MMMMMM,...best enjoyed with a loved one & a good cup of tea! I wonder if they can be made with wheat-free flour? Heh, we'll see! Grace you do have away with words and apparently Harold does too with his "shapely peaks". Nice review, I'm always in market for a new cookbook and it's nice to have some info before buying. Oh man!! Great pictures--the fluffiness is magical. Thank you for sharing this fantastic recipe! OMG...YUMM-O, I simply love the picture, it really is darn good looking. You must be busy! Hope all is well, I miss your good food. Can't wait to see what's next, always some great baked treats from you! You have seriously inspired me to bake muffins for breakfast... I am so excited! Good stuff! I like tips etc.. I met Harold McGee last year when he was at a speaking engagement in Berkeley. I told him about my avocado findings. It seems that the volatile gasses in onions, if in contact with an open avocado, will slow down the aging process/oxidation. Hope you are well! What am I saying? by the looks of this fluffy cranberry delight, you sure as h... are! This book sounds like one's very own Culinary Institute! Yummm Grace. These muffins look incredible! I love cranberries. Those are some nice peaks you have! Thanks for the tips; I love cranberries in baked goods (I'm a big fan of the tart!). For the tip #2, how do you spot the sour cranberry while sorting through the batch? Is there something visual to be looking for? Totally asking for that book for Christmas! Thanks for the tip and the delicious looking muffins!